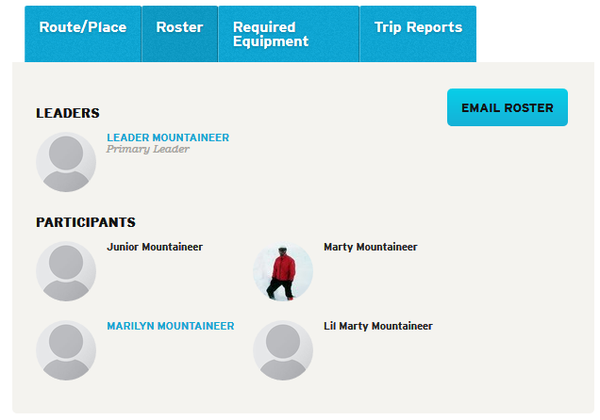 NOTE: Marty Mountaineer is "you," Marilyn Mountaineer is the logged-in member/guest, and Leader Mountaineer is the logged-in leader in the examples below. To choose whether to share your profile with fellow members and guests (when they are logged in), check or un-check the "Make My Membership Private" box in the "Preferences" section. Find this box when you edit your profile. If you want to carpool and communicate with other members and guests who are in the same courses and on the same trips, you need to set your profile to "viewable" by un-checking the "Make My Membership Private" box. Notes: To see the "Email Roster" button, you must be registered for the activity. In this example, Marilyn Mountaineer is logged in. Marty Mountaineer is registered and has a viewable profile. Junior Mountaineer and Lil Marty Mountaineer are registered for this activity, but their Profiles are private - which is why their names are not links. Notes: To see the "Email Roster" button, you must be registered for the activity. In this example, Marilyn Mountaineer is logged in. MARTY MOUNTAINEER IS REGISTERED AND HAS A VIEWABLE PROFILE. Junior Mountaineer and Lil Marty Mountaineer are registered for this activity, but their Profiles are private - which is why they are not displayed in the "email roster" list. Members and guests cannot find your profile in a search of our website and will get an error if they attempt to view if from a direct link. Notes: To see the "Email Roster" button, you must be registered for the activity. In this example, Marilyn Mountaineer is logged in. Marty Mountaineer, Junior Mountaineer, and Lil Marty Mountaineer are registered for this activity, but their Profiles are private - which is why their names are not links. Notes: To see the "Email Roster" button, you must be registered for the activity. In this example, Marilyn Mountaineer is logged in. Marty Mountaineer, Junior Mountaineer, and Lil Marty Mountaineer are registered for this activity, but their Profiles are private - which is why they are not displayed in the "email roster" list. Leader's profile must be set to viewable so that members and guests may access their leader's contact information. Before sending any pre-trip correspondence, leaders should check to see if any participants on the activity have a private profile - they may do this through either the activity roster or the email roster. Leaders must respect member and guest privacy by using BCC to communicate with any participants who have a private profile. Please note that the "Email Roster" functionality through The Mountaineers website only allows for BCC. If a member has concerns that another member has misused his or her information, please contact info@mountaineers to flag the issue for follow-up. Leaders may suggest or remind participants that a viewable profile makes it easier to communication with the group to arrange carpooling, group gear, etc - but they may not require participants to make their profile viewable, and they may not share a private participant's contact information without explicit permission.